Jax Utilities Management Inc., was cited for exposing employees to trenching hazards after a worker was hospitalized for injuries caused by an unprotected trench collapse. The Jacksonville utilities contractor was also cited for exposing employees to struck-by and caught-in hazards, allowing employees to work without cave-in protection, and allowing water to accumulate in the trench. OSHA proposed penalties of $271,606. Read the news release for more information. The California Occupational Safety and Health Administration (Cal/OSHA) cited Alhambra Foundry Co. Ltd., for eight safety and health violations after an employee’s legs were amputated to free him from an auger screw conveyor. 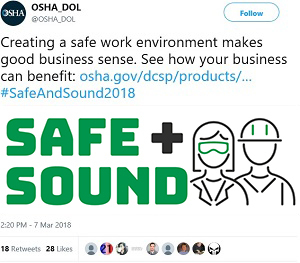 Cal/OSHA’s investigation determined that the foundry failed to de-energize and lock out the equipment before employees performed cleaning operations, did not have a permit-required confined space program, and did not provide an attendant to monitor the confined space. The company faces proposed penalties of $283,390. For more information, read the news release. Iowa OSHA issued 11 citations and $306,500 in penalties to East Central Iowa Cooperative in Waterloo for exposing workers to amputation and engulfment hazards. Iowa OSHA inspected the facility following a fatal incident when a worker was engulfed in flowing grain. 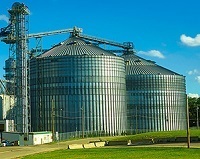 Inspectors found that the cooperative failed to: provide workers entering grain bins with secured body harnesses; install machine guards on grain handling equipment; and train workers on proper grain bin entry conditions. OSHA, the Houston Chapter of the Association of General Contractors, the American Ladder Institute, and the University of Texas OSHA Education Center, are sponsoring a National Ladder Safety Symposium March 29 in Houston. Presentations will focus on best practices for preventing ladder-related injuries and fatalities. A webcast of the event will be available. For more information and to register, visit the symposium website. 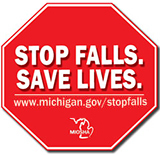 Michigan Occupational Safety and Health Administration recently launched year two of its “Stop Falls. Save Lives.” safety campaign to raise awareness about fall hazards and prevention. This year the focus will be on reducing worker fatalities in the roofing industry. Employers are encouraged to hold stand-downs and voluntarily stop work to review best practices and educate workers on fall hazards. Read the news release for more information. A daylong safety summit for employers and workers will be held June 14 at the University of Massachusetts in Amherst. Regional and national experts will hold workshops on topics such as drugs in the workplace, beryllium, fall prevention, emergency preparedness, electrical hazards, machine guarding, and developing a safety culture in construction. For more information and to register, visit the Summer Summit website. As part of its Alliance with OSHA, the National Grain and Feed Association will host a free webinar on April 10. The event will present ways to prevent injuries and fatalities from grain engulfment. You can register online to participate in the webinar, which is part of Stand-Up for Grain Engulfment Prevention Week, April 9-13. A safe and healthful workplace doesn’t happen by chance, it happens by design. Create and maintain a safety and health program in your organization to prevent workplace incidents before they become injuries or illnesses. OSHA’s On-Site Consultation Program offers free, confidential occupational safety and health services to small and medium-sized businesses, with priority given to high-hazard worksites. On Site consultation services are separate from enforcement and do not result in penalties or citations. For example, Tennessee OSHA (TOSHA) Consultative Services offer consultations to the state’s smaller employers, such as foam product manufacturer, Cassemco Inc., to help identify workplace hazards, comply with OSHA standards, and improve safety and health programs. After working with TOSHA consultants, Cassemco’s 24 employees have been free of workplace injuries for the past three years. Frank D. Riggio Co. Inc., contacted OSHA’s On-Site Consultation Program to improve workplace safety and health practices at its valve repair facility in Bayonne, N.J. OSHA consultants helped the company create a workplace safety and health program, conduct employee training, and correct hazards. Both noise and air sampling were performed to ensure that employees were not being exposed to health hazards. Riggio has not had a recordable workplace injury in three years. For its commitment to improving workplace safety, the company was accepted into OSHA’s Safety and Health Achievement Recognition Program. For more information, see the company’s success story. The International Brotherhood of Teamsters – Local 1150 renewed a five-year agreement to help protect the health and safety of workers in the aircraft manufacturing and related industries. The Associated Subcontractors of Massachusetts renewed a five-year agreement to focus on topics such as scaffolding, fall prevention, electrical safety, lead, and silica in the construction industry. For more information, see the news release. Clarion University Small Business Development Center signed a two-year agreement to provide small businesses with information and training resources related to occupational safety and health hazards, and workers’ rights and employers’ responsibilities under the Occupational Safety and Health Act. For more information, see the news release. The American Subcontractors Association - San Antonio Chapter renewed a two-year agreement to prevent electrical, machine, fall, and struck-by hazards in construction. Howalt+McDowell Insurance signed a two-year agreement to address trenching, falls in construction, employee safety training, and hazard identification. OSHA has released two new Safety and Health Information Bulletins warning of potentially serious workplace hazards. "Preventing Hearing Loss Caused by Chemical (Ototoxicity) and Noise Exposure" was published in conjunction with the National Institute for Occupational Safety and Health. This bulletin provides recommendations to employers and safety professionals about identifying ototoxicants in the workplace and establishing hearing conservation programs where these chemicals cannot be replaced. "Avoiding Underground Utilities during Horizontal Directional Drilling Operations" highlights the hazards associated with striking different underground utilities. Horizontal directional drilling has reduced visibility compared to vertical drilling. The bulletin was based on an incident that led to an explosion at a nearby restaurant that resulted in a worker fatality. CPWR – The Center for Construction Research and Training, an OSHA Alliance participant, has revised its free Construction Chart Book. 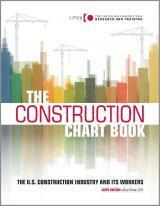 Produced with support from the National Institute for Occupational Safety and Health, the book provides extensive statistical information covering economic, demographic, employment/income, education/training, and safety and health issues in construction.